The Furniture Bill of Sale is a document that will provide proof of the legal sale and purchase of any type of furniture, indoor or outdoor. 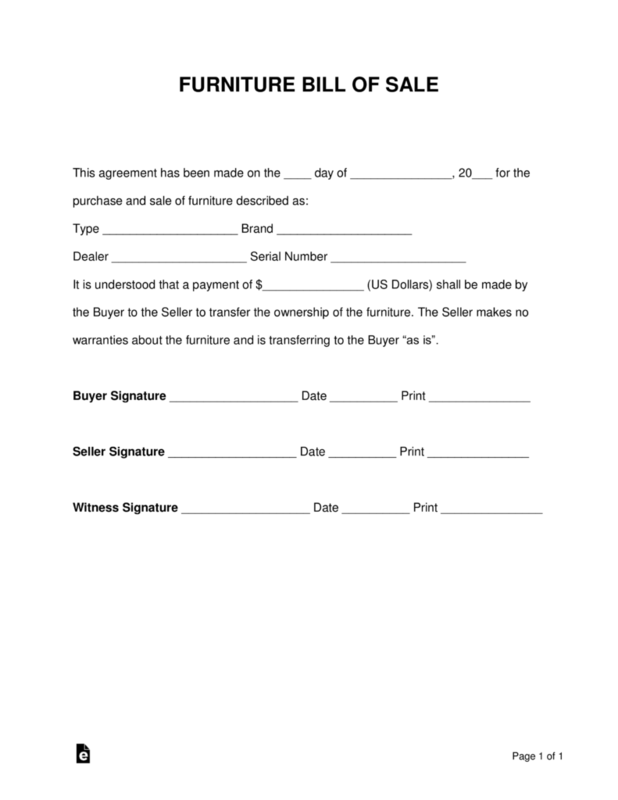 The document will be completed and provided at the point of purchase to be retained as a receipt to the buyer. A copy of the document should be provided to all signatories for their records. 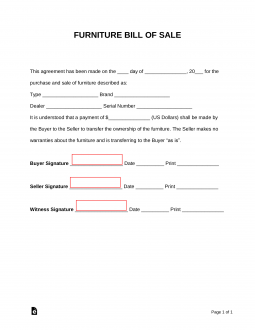 Why Is It Important to Use a Furniture Bill of Sale? Once you give the old furniture a new shine with a bit of cleaning and refurbishing (if necessary), take some quality photos of the furniture. Take shots from different angles to give potential buyers a good idea of the size, color, and details of the furniture that’s up for sale. You may want to let friends and family know you’re selling so they can help spread the word. Then, post some flyers, use social media to your advantage, and/or use newspaper or online classifieds to attract buyers. Allow buyers to see the furniture in person before they decide. Then, they’ll likely try to negotiate the price. Work with them to find an agreed sales price. Then move forward with the bill of sale form.